A number of Irish League Premiership and Championship matches were postponed due to the heavy rain on Tuesday. 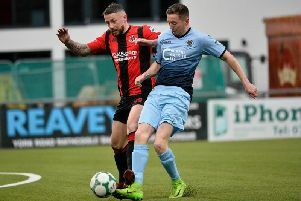 The Danske Bank Premiership matches between Glentoran and Dungannon Swifts and Ballinamallard United and Carrick Rangers were called off. The playing surfaces at the Oval and Ferney Park were deemed unplayable following pitch inspections after heavy rain caused them to be waterlogged. The crunch game at the top of the table between leaders Crusaders and Coleraine at Seaview goes ahead as planned. The league game involving Glenavon and Linfield at Mourneview Park is on after the pitch was deemed playable at 15:00. Ballymena United v Cliftonville is also on after an afternoon inspection. The Championship games at Knockbreda, Lurgan Celtic and H&W Welders wered all been postponed. Knockbreda were scheduled to face PSNI, Lurgan Celtic were hosting Limavady United and H&W Welders were due to play Institute. The match between Lisburn Distillery and Moyola Park in the Premier Intermediate has been given the go-ahead following a pitch inspection.